Why has my email split into a new conversation? 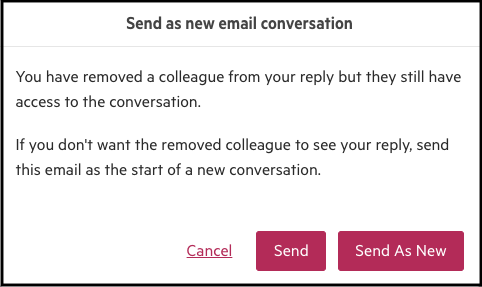 If a colleague is removed from an unshared email, the conversation is split into a new one, to protect privacy. Emails in Karbon can be split into new conversations in some circumstances. The most common reason for this is if a team member is removed from an unshared email conversation. When this happens, the email is split and sent as a new email conversation. This is to ensure the removed team member cannot access an email that may be intended to be private. A message will display to inform you that this is happening. The original email conversation will then provide a message and link to the new email conversation.